We’d love your help. Let us know what’s wrong with this preview of Tails of a Healer by Rose De Dan. Eleven years in the making, Tails of a Healer: Animals, Reiki and Shamanism features 45 true and heartwarming stories about animals and their role in the life and evolution of a gifted energy worker and shamanic healer. This inspiring collection of tales, featuring dozens of black and white photographs by the author, is brought together here in one place for the first time Eleven years in the making, Tails of a Healer: Animals, Reiki and Shamanism features 45 true and heartwarming stories about animals and their role in the life and evolution of a gifted energy worker and shamanic healer. This inspiring collection of tales, featuring dozens of black and white photographs by the author, is brought together here in one place for the first time. 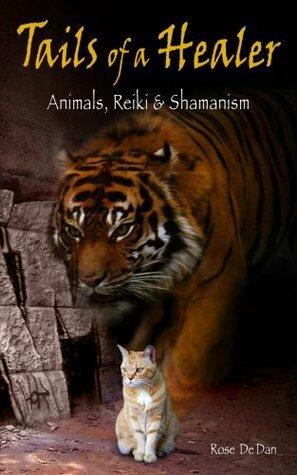 "'Tails of a Healer: Animals, Reiki and Shamanism' is jam-packed with animal stories that delight the senses, tickle the imagination, and transcend the mundane into the realm of mystery. Author Rose De Dan is not only a gifted healer, shamanic practitioner, and Reiki Master; she is also a master storyteller. The true-life tales in her book will make you laugh and sometimes cry. They'll make you think and they'll fill you with wonder. Most of all, De Dan's stories will teach you about the fine art of bridging worlds: between animals and humans, between heart and mind, between body and soul, and between consensus reality and the deeper levels of reality that nurture and sustain us all. 'Tails of Healer' is a gem!" "'Tails of a Healer' takes you deeply into the world of telepathic animal communication and shamanism. It is a rich mix of intimate animal stories that are both healing and enlightening. Rose De Dan has packed this book with wisdom and heart. Prepare to be opened." To ask other readers questions about Tails of a Healer, please sign up. Excellent collection of stories by Reiki Master and Shaman (Four Winds Tradition) Rose De Dan. Casual writing style makes for a quick read. I was actually sad when I finished the book as I could have read a volume twice as long it was so enjoyable! She speaks of the influence and benefit of Reiki to assist going through daily life occurrences and major life changes as well as her work on both humans and animals. If you are an energy healer of any kind this is a great volume to add to your librar Excellent collection of stories by Reiki Master and Shaman (Four Winds Tradition) Rose De Dan. Casual writing style makes for a quick read. I was actually sad when I finished the book as I could have read a volume twice as long it was so enjoyable! She speaks of the influence and benefit of Reiki to assist going through daily life occurrences and major life changes as well as her work on both humans and animals. Fluffy anecdotes. Easy fall asleep reading. Rose De Dan, Wild Reiki and Shamanic Healing LLC, is an energy healer, animal communicator, teacher and author who resides in Seattle, Wash. with her charismatic cats Manitou and Night Sky. Wild Reiki and Shamanic Healing began in 1996, pioneering an alternative energy healing practice for people and animals. Rose views her role as a healer/animal communicator as one of building bridges between peo Rose De Dan, Wild Reiki and Shamanic Healing LLC, is an energy healer, animal communicator, teacher and author who resides in Seattle, Wash. with her charismatic cats Manitou and Night Sky. Wild Reiki and Shamanic Healing began in 1996, pioneering an alternative energy healing practice for people and animals. Rose views her role as a healer/animal communicator as one of building bridges between people and animals through sessions, ceremonies, events and classes.